never be satisfied), New York tyrannophiles are proposing yet another insidious infringement that will not only result in sweeping gun bans, but will render allowable guns dangerous to their owners as well as to others when the guns are deployed in self-defense. Senate Bill S3444, authored and sponsored wholly by Democrats, will all but ensure more injuries and deaths in the name of protecting children. How does Serrano's bill propose to "childproof" a gun? The prohibition would apply to pistols or revolvers manufactured twelve or more months after the effective date of the bill. Design features could include the capacity to adjust the trigger resistance of the gun to at least a ten pound pull, the capacity to alter the firing mechanism so- that an average five year old child's hand would be too small to operate the gun, or the capacity to require a series of multiple motions in order to fire the gun. To make the case that this can be done, the bill reminds us of what even NRA characterized as "the Smith & Wesson sellout," showing that old "compromises" can have far reaching consequences. 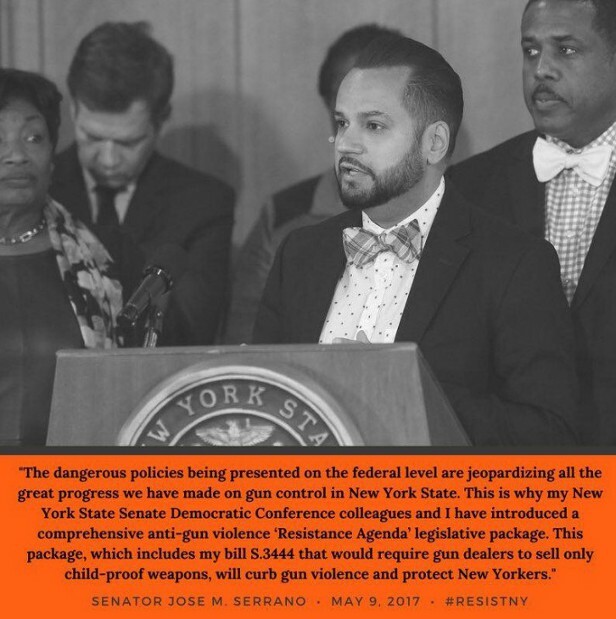 Calling it "critical to the safety of all New Yorkers," Serrano says "one would think that this should be common sense."